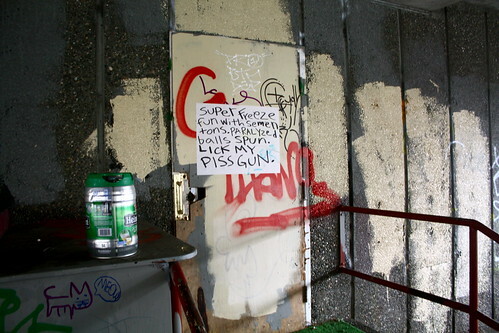 One of the largest abandoned buildings in the Capitol Hill area and a haven for taggers, squatters and who-knows-what is about to be torn down, CHS has learned. And it looks likely a dormant $11 million development project is being geared back up again to replace it at the corner of Pine and Bellevue. According to documents filed with the city’s Department of Planning and Development, a permit has been issued for the demolition of the 26-unit Marion Apartments. And we’ve learned the company that owns the land has made the final payments for the $59,000 in fees it owes for its application to construct a six-story, 118-unit mixed-use building with about 13,000 square feet of ground floor retail. Now DPD just needs to approve the construction. “Like a lot of people, we’re working as hard as we can to attract financing for the project. But, we’ve fallen victim to the credit crunch,” Stratford Company CEO George Webb told CHS in July 2010 when we took a look at the Hill development that had become mired in the global real estate crash and the looming reminder of an abandoned apartment building falling into decay. The Stratford Company first brought the proposed development known as Pine Street Condominiums to the city’s design process in August 2007. The design was approved in 2008 — with conditions (see the embedded document below — but hasn’t moved forward until now. Given what we’ve seen in all of the new wave of development on the Hill, it seems likely this project will also be transitioned to an apartment-based sales plan but we’ll need to confirm that with the developer before anointing these the Pine Street Apartments. We are in the process of finalizing our building permits and capitalizing the project. We plan to break ground as soon as we can obtain a construction loan for the project. It will definitely be apartments so you can remove the doubt about that in the article. Also, we did make a change awhile back that it appears hasnt been picked up in your reporting to make the Bellevue ground floor space live/work, so we will have 132 units (not 118) + about 4,000 sq ft of commercial. In the intervening years, the building has become a magnet for street art, taggers, squatters and everything in between. 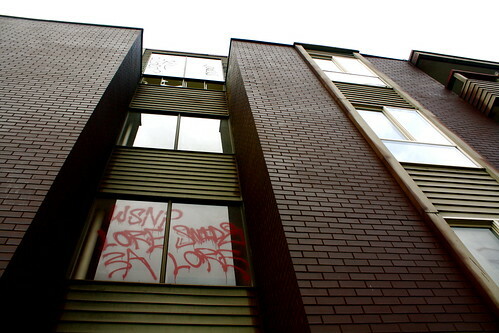 DPD has fielded numerous complaints about the property and Webb told us that on numerous occasions he has had vagrants removed from the building and graffiti painted over. It hasn’t all been bad — the space under the abandoned building’s overhang has been used for guerrilla flea markets and street performance. 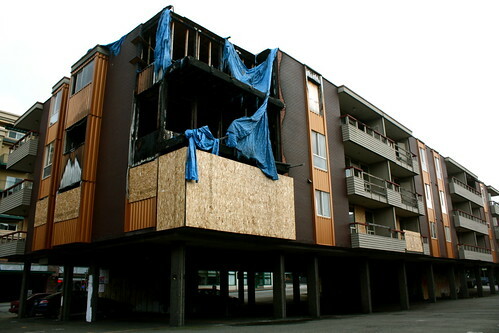 But in addition to the graffiti, the old apartment building has a gaping, charred hole on its northwest corner from the October 2008 fire that ripped through part of the building as its final tenants were being moved out. Investigators determined that the fire was intentionally set by 89-year-old Ed Jackson who had served as the apartment manager and the neighborhood’s de facto nightwatchman. Jackson died in the blaze. The 1623 Bellevue project to the north of the Marion Apartments appears to still be on hold though inspections for a demolition were completed in 2008. 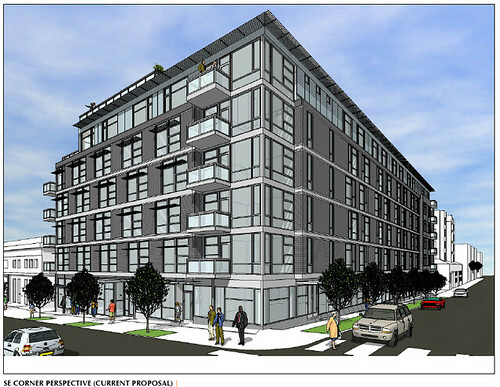 The sudden motion on the Bellevue/Pine project continues the trend of the great development thaw of 2011. If demolition and construction moves forward soon, a three block stretch of East Pine from Bellevue to Belmont will suddenly be a very busy place. The long-stalled development at Pine and Belmont replacing the People’s Parking Lot is full-steam ahead and apparently making quick progress. Up the Hill, the 230 Broadway project is ready to begin demolition soon. Demolition is already in progress at 13th and Madison and work at 16th and Madison is gearing up. At 19th and Madison, they are already driving pilings and pouring concrete. 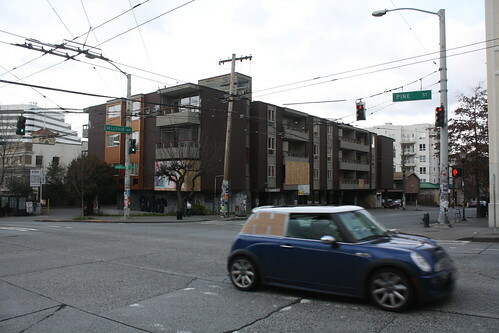 Meanwhile, an appeal is holding up similar progress on the Bullitt Foundation’s project at 15th and Madison where the old CC Attle’s has already been swept away. And more is coming soon. We reported last week that the ambitious Sunset Electric development at 11th and Pine is on path for a summer start of construction. Streetcar 2013. Light rail 2016. Busy days on the Hill. In addition to noise, dirt and putting big trucks on the street, this burst of construction energy is powering an extremely rapid overhaul of some key areas of the Hill. How Pike/Pine and all of Capitol Hill can manage to keep its “grit” in the face of so much redevelopment remains to be seen. For now, with yet another truckload of dirt bumping down the road toward I-5, things will probably be plenty gritty. I wasn’t happy when the apartments were being taken away in favor of development, but I’m less happy that it’s been a dangerous derelict burnt building that doesn’t do anybody ANY good. I refer to that place as Capitol Hill’s little slice of Silent Hill. 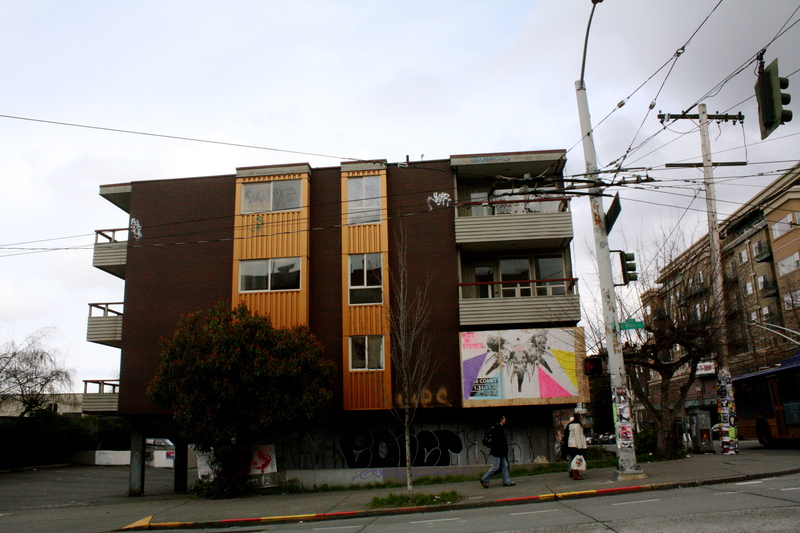 I’m glad the old rat trap is going, given its sad story and tragic, horrible end, but Cap Hill needs another condo like another hole in the head. More snotty condo pricks. Lowercase yay. “Snotty condo pricks”?…..wow, talk about an over-generalization! Just because someone can afford a condo doesn’t make them a bad person. Get real. It’s not like Capitol Hill needs anymore faux hipsters either. At least the folks in the condos have jobs. It is hard to tell from just one rendering if the overall project will be visually pleasing, but the one shown looks good — no faux historicism. Yeah! I really hope the retail floor is successful. That’s an important intersection to the entrance of Pike/Pine and many of the newer buildings in that area seem to have a difficult time successfully filling their retail floor. It’s such a busy corner with the bus stop and pedestrian traffic. Let’s hope it doesn’t remain a dark zone at the ground level. Hopefully reasonable spaces and rents. Too many of the condo retail spaces are too big and expensive for anything but a big chain. Capitol Hill already has an Urban Outfitters and Cheesecake Factory is just four blocks away from this site. Tracked down the EDG packet from our earlier coverage and re-posted above. Finally! maybe we can that hip and urban Applebee’s we need so badly! ITA with this. And for a new building, I think the design will fit in the area as well as can be expected. Small units are becoming more desirable, and are a great trend, imo. Cooltown Studios runs a great blog about urban development, and identifies some interesting trends when it comes to encouraging developers to build more efficient apartments and condos: http://www.cooltownstudios.com/2010/08/11/small-cool-apartme. To continue to make room for awesome shared spaces which make a city more livable and enjoyable, we have to work to keep living spaces realistic. I am 100% behind more living space on Capital Hill, however, it needs to be affordable housing and not these over priced condos or apartments that no one I know can afford to live in. Everyone I know is being forced further and further off the hill because of the amount being asked for housing compared to what people are making an hour. We NEED affordable housing on Capital Hill NOW! I agree totally but please learn how to spell your own ‘hood’s name! This is my ultimate peeve!!! Just look at the title of the blog, man! This project is the most heartbreaking example of the housing bubble bursting. Yes, it is annoying that we have this derelict building sitting here for the last three years. But it absolutely breaks my heart that Mr. Jackson perished here under the assumption that the tear down and redevelopment of his property was imminent. Only to sit there for the next three years…if only he could have known what we know now then. Perhaps we could have saved his life! terribly tragic. That was a great building: good sized units (who wants to bet the new building has apartments that are half the size, with less soundproofing?) and reality-based balconies – none of this “Juliet” nonsense. I do agree that so ething has to be done with it, and I’m glad to see it put put of its misery, but I’d much rather have seen it kept as a functioning apartment building. I wonder how many sushi/thai/pizza places they can cram into that space. Well, get used to it. As more people move to urban centers, and there are fewer ‘real houses’ and fewer people can afford a big house, there will be more and more condos. That’s just a fact of the current economy and housing trends. The confirmed that it will be apartments, not condos. Read the updates above. I’m still going to tag it, anyway. Based on the language above, it will be a parking lot for a couple of years to come once they tear down the old building. @nomadicq- ‘Awesome shared spaces”?? Are you selling these tiny apts/condos? No one needs to ‘encourage’ developers to build smaller spaces. They’re happy to do it (and they ARE doing it) and still charge $$$$ per square foot. Packing more units into the sq footage of the entire building just makes them more $, while people pay $1300 for JR or OPEN one bedrooms at the base level. 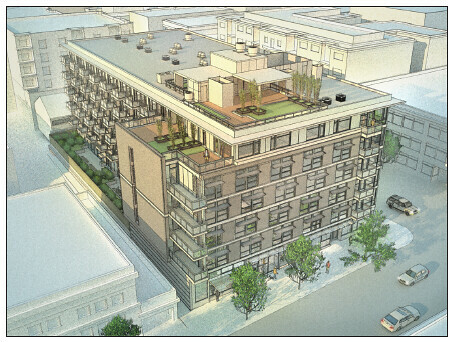 Take the Marion Apts for example – a 3 story 26 unit building with REAL balconies vs a six story 118 unit building. I wonder what the difference in price ++ vs the sq ft – you’re ending up with. @B no, I don’t sell condos. I was merely trying to make the point that I am A-OK with making smaller individual condos (that are a nice size, but not super-sized) in order to maintain plenty of space for other great city amenities like parks, libraries, etc. Those were the awesome shared spaces I was referring to. Finally! This place has become dangerous and filthy, it should have been torn down years ago.